So we all love Pinterest right?? I know I do! It is a wonderful resource that I use to “pin” or organize ideas that I come across as I am blog reading AND it is also a great place to find ideas that others have pinned! So true! And 9 months or so after joining Pinterest, I currently have 3,734 pins. Wow! Some I have pinned strictly for blogging reference, some are recipes which I have actually tried, some are for future holiday inspiration, BUT bottom line…. I recently simplified and organized my kitchen and I remembered this idea and thought it would work great to help with freeing up some cabinet space. This was a very cheap and easy project and only took about 30 minutes to do not counting paint drying time. I sanded the paint sticks and edges smooth and put on a coat of light gray paint. And went to bed! The next day, I measured out where I needed the cup hooks to be and marked it with the screw. Since these hooks were so small, it was a little of a challenge to get them started but I finally did and I have the raw spot on my finger to prove it. I labeled where each cup would hang, used a small nail on each end to secure it to the cabinet door, hung my measuring cups, and stepped back to see! I did the same thing for another board to hang my measuring spoons on. If measuring cups and spoons could be cute, these would be cute! Love the simple organization of it all. Then because I was on a creativity roll, and since when I was looking up the pin for this post I happened across this picture from Infarrantly Creative, I decided to add measuring chart too! So I combined that chart plus her chart into mine own, printed it out, and hung it above the measuring spoons. So here is my finished Pinterest inspired project! Love it! And yay for finally doing a project I pinned! Hmmm… think I better go get busy on those dishes and cleaning off that counter! So what project have YOU pinned on Pinterest that you need to get to work on? Or maybe you are on of those super “pinners” who completes every pin a week after they pin it! If you recently did a Pinterest project, link it up in the comments so I can come “pin it” and add to my growing list of pins I need to do. This is a great idea! I could use the extra room in my utensil drawer, so I should definitely do this!! I really like it. 🙂 I just need to get some cork to put behind it to cut down the noise…. It looks great! I also have this pinned, but haven’t actually done it because I was afraid it would be time-consuming or hard. You’ve made it look easy peasy! it really is easy! and mostly free since I already had the paint sticks. I have shelves like that in my pantry too! great space saver. and I have them under the sink on the cabinet door there for saran wrap and stuff. nope, didn’t forget! still think of it every time I look at a picture of flowers hung on my wall – LOL! I keep thinking I’ll do this with my measuring cups, but I’ve got my cabinets jammed full I’m not sure the doors will shut. Love the keeping it real photo! I only did this after purging my cabinets! LOL! What a cool idea! My wheels are turning now. 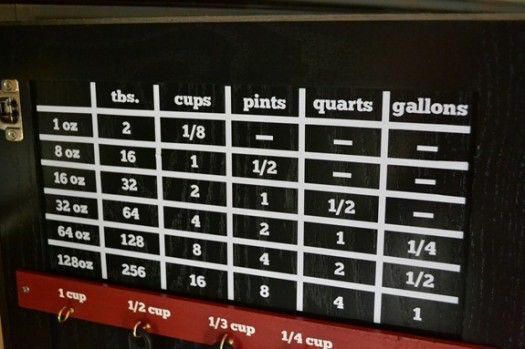 I’m definitely going to implement this somehow in my kitchen because I’m so tired of digging through my utensil drawers, looking for measuring cups and spoons. Thanks for sharing! I loved this idea and tried it, too – but, with command hooks rather than the wood strips. Works wonderfully, but you’re so right about needing cork or something sound-deadening behind them. The noise gives me a fright each time I open the cabinet door! LOL!